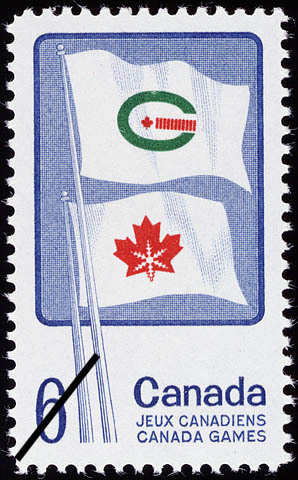 The value of a Canada Games - 6 cents 1969 stamp depends on several factors such as quality and wear, supply and demand, rarity, finish and more. Values in the section are based on the market, trends, auctions and recognized books, publications and catalogs. This section also includes information on errors and varieties and characteristics. A significant advance in the encouragement of emerging athletes has been achieved by establishment of the Canada Games, a concept which reached fruition at the 1st Winter Games held in Quebec City and area from February 11 to 19, 1967. The eligibility of entrants, male or female, all representing their home Province or Territory, is restricted to Canadian citizens or landed immigrants with 2 years residence in Canada. By eliminating rigid qualifying athletic standards it is hoped that aspiring athletes will gain from association and competition with those who have achieved national or international status. Some 1,800 persons, representing all Provinces and Territories, competed in 14 sports at the 1967 Quebc Games.